Hello degenerates! College football season is here and that of course means it is time for Statistically Speaking's weekly (or weakly) troll through the spreads. 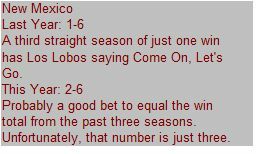 I will give you five underdogs and five favorites for you to pick on your (for entertainment purposes only) parlay card. For those of you who joined us last year, I apologize. I have burned the game film from last year and have consulted a new psychic so this year's picks should be rock solid. Home teams in Bold. Under Chris Petersen (Boise coach since 2006), the Broncos are 7-2 Against the Spread (ATS) versus BCS conference teams. In both of their failures to cover the number they were favorites (against Washington in 2007 and in 2010 against Oregon State). As an underdog, they are one of the safest bets on the board. Sure the Broncos have lost a great deal from last year's team, but Michigan State must also replace their departing quarterback and every significant receiver. The Spartans are still solid on defense, particularly in the front seven with William Gholston and Denicos Allen returning to make plays in the backfield. I foresee a tight defensive struggle. Take the Broncos getting nearly a touchdown and enjoy what should be one of the better Friday night games of the year. Over the past five seasons, Northwestern is just 2-7 ATS as a road favorite. Granted, with just a nine-game sample size over five seasons, this means the Wildcats are not often road favorites. One of those games was against Syracuse in 2009. The Wildcats came in as a three-point favorite and left with a three point defeat. In fact, as a road favorite against BCS conference teams, the Wildcats have covered just once in seven games (last season against an awful Indiana team). Both these teams are flawed but Syracuse is very liable to pull off the straight up upset at home. Steve Sarkisian has managed quite a turnaround in Seattle, leading the Huskies to 19 wins over his three seasons as coach after the team managed just 18 wins in the preceding six seasons. His Huskies are rightly favored in this game, but San Diego State is a solid Mountain West team that improved substantially under Brady Hoke and was able to tread water despite losing Hoke to Michigan. Rocky Long has endeared himself to this blog by eschewing conventional wisdom and claiming to show some fourth down balls. We'll see if he actually goes through with that proclamation. In the meantime, we'll give him the benefit of the doubt and take his Aztecs to cover here. Baylor enjoyed their best season in ages last year as they won 10 games and finished the season ranked 13th in the AP poll. Unfortunately, the three biggest reasons for that special season, quarterback Robert Griffin III, running back Terrance Ganaway, and receiver Kendall Wright are gone. In addition, the Bears also had two players from the offensive line taken in April's NFL Draft (Philip Blake and Robert T Griffin). Suffice to say the offense will not average close to 600 yards per game this season. That means the defense must improve if Baylor is to attend a third-straight bowl. Unfortunately, the Bears have allowed an average of fewer than 400 yards per game just once (2008) in the past six seasons. Baylor is rightfully favored, but they should not be a double-digit favorite against a solid in-state rival with a chip on their shoulder. In Paul Johnson's four seasons as head coach at Georgia Tech, his Yellow Jackets are just 1-3 against the Hokies. However, they are 3-1 ATS, including covers in both previous trips to Blacksburg. Virginia Tech has had a whole offseason to prepare for the peculiar and occasionally perplexing triple option attack. However, the Hokies are breaking in eight new starters on offense, including four along the offensive line. Georgia Tech's primary weakness in the past two disappointing seasons (combined 14-12 record after a 20-7 mark in 2008-2009) has been the performance (or lack thereof) from the defense. Virginia Tech should not be able to run roughshod over the Yellow Jackets. Three of the four meetings since Paul Johnson took over have been decided by seven points or fewer and I think this one will continue that trend. Know where Michigan was ranked last preseason? They weren't. Know where they are ranked in this preseason? Number 8. Remember Texas A&M last year? Ole Miss in 2009? Clemson in 2008? 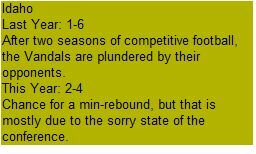 The track record for teams not ranked in the preseason one year and subsequently ranked in the top-10 the next preseason is one of disappointment. Plus, challenges don't come more difficult than the defending national champions. Last season, while they did lose a game, the Alabama defense proved to be one of the more dominant in recent history. Like an atom smasher, they destroyed opposing offenses on the sub-atomic level. And head coach Nick Saban? Under his tutelage, Alabama is 8-1 ATS versus non-conference BCS opponents. Their lone failure to cover came against Florida State in 2007 (Saban's first season), meaning his charges have covered eight in a row. This one could get ugly very fast. What's the best way to overcome the sting of a successful, but disappointing 9-4 season? Slaughtering a non-conference opponent in front of a sea of red clad partisans. Southern Miss has to replace a ton of starters and is breaking in a new coach fresh off perhaps their most successful season in school history. Lincoln, Nebraska is not the ideal place to start a season, unless you are a Cornhusker. Nebraska should roll the Golden Eagles without much trouble. Meyer ball debuts in Columbus on Saturday, and while the Buckeyes are ineligible for the postseason this year, they should be much improved after their 6-7 finish last season. The defense should be their usual rock-solid selves and Meyer should be able to coax the offense, lead by sophomore quarterback Braxton Miller into scoring enough touchdowns to cover this large number. At first glance, this spread seems egregiously low. Miami finished just 6-6 last season, but each of their losses were by eight points or fewer. Based on the Adjusted Pythagorean Theorem I introduced back in March, the Hurricanes should have won about six games...in the ACC (instead of the three conference wins they ended up with). Meanwhile, Boston College also finished with three conference wins, but their won/loss total was much closer to their actual performance. In a unique twist, both teams faced each other in their final game last season. Boston College ended their season on a high note winning 24-17 in Coral gables. Maybe Vegas knows something we don't about this game. And if they do, it wouldn't be the first time. Rich Rod debuts in the desert against a dangerous MAC squad. Unfortunately for Toledo, while they should remain strong on offense with Terrance Owens under center, their defense must replace seven starters. That's bad news against a Wildcat offense lead by quarterback Matt Scott, an experienced athletic senior who red-shirted last season. This should be a high-scoring affair, with Arizona mustering just enough defensive stops to get the cover. We have finally made it. This is the last of the season previews and with just four days to spare before the beginning of the 2012 college football season. To see last year's Sun Belt preview, click here. The Sun Belt has only been around (for football at least) since 2001. In that span, they have routinely been the worst conference in DI college football. 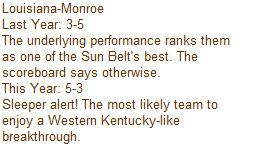 They may have an argument for being better than the WAC this season, but for the most part the label has been deserved. However, that doesn't mean the conference has not had its moments. 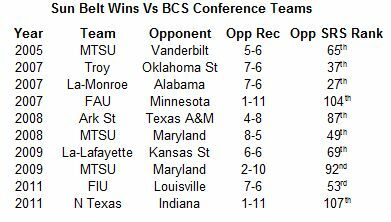 Since 2005, Sun Belt teams have won 10 games against teams from BCS conferences. In 2011, Sun Belt member FIU even beat a team (Louisville) that eventually tied for their conference championship (Big East). Still, that Louisville team managed only a 7-6 record. So which Sun Belt victory has been the most impressive? The following table lists the 10 BCS conference teams Sun Belt squads have beaten, the final record of those BCS conference teams, and the SRS ranking of the BCS conference teams. For the most part, as would be expected when discussing the worst conference in DI football, most of the victims have been bad. Seven of the wins have come against teams with final SRS rankings below 50. The most impressive win was probably also the most shocking at the time. Louisiana-Monroe upset Nick Saban's first Alabama team in Tuscaloosa. While that Alabama team finished just 7-6, all their losses came by seven points or less. Couple that with a tough SEC schedule and you can see why their SRS ranked in the top-30. So what BCS conference teams should be on high alert when facing Sun Belt teams this year? FIU has two early opportunities for BCS scalps when they open at Duke and host Louisville three weeks later and Louisiana-Monroe hosts a depleted Baylor squad on a Friday night in mid-September. On paper those appear to be the only real shot that Sun Belt teams have of knocking off one of the big boys in 2012. One week to go. This upcoming weekend is out last without football for the rest of the year. Rejoice! To see last year's MAC preview, click here. Where Have the Elite MAC Teams Gone? It was early 2004. Miami of Ohio, lead by Ben Roethlisberger (pre-NFL and pre-sexual assault edition) had just won the MAC, finished 13-1, and landed at number 10 in the AP poll. Joining them in the final poll were the Bowling Green Falcons who had won 11 games themselves and finished 23rd. 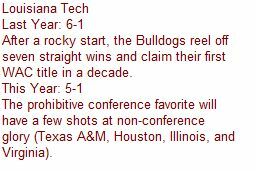 In the eight seasons since, only a single MAC team, Central Michigan in 2009 (23rd), has finished in the final polls. Have the pollsters been blind to quality teams, or have the elite MAC teams simply not been as good in the last eight years? To find out, I examined each MAC season since 2003 and calculated where the MAC team with the highest SRS rating ranked nationally. The SRS, or Simple Rating System is a quick and dirty way to rate teams used by college football reference dot com. If you want a quick primer, here is the link to the definition of SRS. 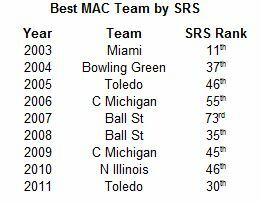 The table below lists the highest ranked MAC team by SRS each season since 2003 and their national rank in SRS. As you can see, Miami earned their top-10 ranking in 2003, finishing with an SRS ranked 11th in the nation. Otherwise, no team outside of Toledo in 2011 has been deserving of any top-25 votes. Central Michigan in 2009 was probably a little overrated when they finished ranked 23rd, with their lone win of note coming over a Michigan State team that finished 6-7. Can the MAC produce a top-25 caliber team in 2012? Probably not. The MAC in 2012 should have much parity in both divisions, but while that makes for compelling races it also makes for a lot of conference losses. I apologize for the dearth of posts in the last week, but I was in the midst of a vacation. Now I'm back, and more importantly, there are just 10 days remaining until football season commences. To see last year's WAC preview, click here. With Boise State exiting stage left after the 2010 season and Fresno State, Hawaii, and Nevada following suit after 2011, the remaining teams in the WAC have not experienced a great deal of recent success. While Louisiana Tech and Utah State combined for an 11-3 league mark and a pair of close bowl losses, their performance in 2011 was more an aberration than a trend. 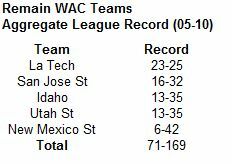 The following table lists the five WAC teams that have been in the conference since the last major realignment in 2005 and their aggregate WAC record from 2005-2010. 19 days. You can almost smell the beginning of the season. In this preview edition, we examine the four remaining Independents in college football. To see last year's Independents Preview, click here. BYU coach Bronco Mendenhall has guided his Cougars to seven straight bowl games since taking over as coach prior to the 2005 season. After losing his initial postseason contest as coach of the Cougars, his charges have reeled off five wins in their last six bowl games, making him one of the most successful active postseason coaches. In fact, among active coaches with at least six bowl games to their credit, he ranks fifth in bowl winning percentage. In an odd little coincidence, three of the top-five coaches have coached in the state of Utah, with Urban Meyer leading the rival Utah Utes to bowl wins in 2003 and 2004 before moving on to Florida. Since replacing Meyer, Kyle Whittingham has had quite a postseason run of his own with the Utes. In another odd twist of fate, Mike Riley's only loss in a bowl game came to...Bronco Mendenhall. The countdown has reached 21 days. That's right, just three weeks until kickoff. We can hold on that long. In the preview, Statistically Speaking gives you the breakdown of the Mountain West. Don't get too comfy with the conference layout though. Membership will be changing again next year as arriviste Boise State along with San Diego State pack their bags and head east. To see last year's Mountain West preview, click here. After years of waiting, Norm Chow finally has the keys to his very own football team. At the age of 66, Chow will make his debut as a head coach when his Hawaii Warriors take on Southern Cal on September 1st. Thanks to Chow's time at Southern Cal (offensive coordinator there from 2001-2004) in addition to his stint at NC State tutoring Philip Rivers (2000) and a lifetime as an assistant at BYU (served the Cougars in some capacity from 1973 to 1999), Chow has developed the reputation as an offensive guru. However, since returning to the college game after a three-year stint as the offensive coordinator for the Tennessee Titans (2005-2007), his guru label may be wearing thin. Chow returned to southern California in 2008, but this time it was as offensive coordinator of the cross-town UCLA Bruins. Chow spent three seasons there before become Utah's offensive coordinator in 2011. The table below summarizes his team's offensive capabilities based on SDPI. For the uninitiated, SDPI takes into account how many yards a team gains against their conference opponents. A positive ranking is good. A negative ranking is bad. The number represents how many standard deviations the offense was above or below-average when compared to the average team in the conference. It doesn't take a master statistician to read that table. Chow's team consistently ranked in the bottom half of the Pac-10 and later the Pac-12 in terms of gaining yards, with a bottoming out in Utah this past season. However, sometimes yardage totals don't tell the whole story. Let's look at how many offensive touchdowns his teams scored against their Pac-10/12 brethren since 2008. Again Chow's charges rank consistently below average. In fact, in 36 conference games across four seasons, his teams averaged less than two offensive touchdowns per game (1.92). Obviously that is far from an impressive number. Most of Chow's reputation as an offensive guru likely stemmed from the talent of the players he got to coach. Philip Rivers, Matt Leinart, Reggie Bush, LenDale White, Carson Palmer, Mike Williams, and Keary Colbert, were all NFL-quality players. Chow will not have top-shelf at Hawaii, so it is unlikely he will be able to produce a top-shelf offense.